Five Ways to Outperform the Market. Which One Is Safe? Outperform the market means doing better than the market average. It's also known as beating the market. It happens when your investment portfolio does better than the 7-10 percent annual average the stock market has done over time. For example, an emerging markets fund outperforms the market when it has a higher return than the MSCI index. Market analysts use the term to recommend stocks they think you should buy. 1. Actively managed mutual funds justify their fees by claiming they outperform the market.The fund managers use strategies that make their return on investment superior. They also have a team of analysts, researchers, and data-crunchers to help them. 2. Stockpickers claim they can beat the market by only selecting stocks that outperform. Warren Buffett uses this strategy successfully. He buys controlling shares of companies with high profit margins, a clear competitive advantage, and leaders he respects. Buffett favors stocks that most investors ignore. For that reason, he searches in boring industries like insurance. His stock picking strategy is called value investing. 3. Hedge funds claim they achieve above-average returns by using derivatives. Hedge funds are privately-owned companies that pool their investors' money. A derivative is an investment that bases its value on an underlying asset, like a stock or bond. It uses leverage to outperform the market. For example, with a stock option, the trader doesn't have to put down 100 percent of the value of the stock to buy it. Instead, the trader can get an option to buy it at an agreed upon price by a certain date. Often, he only has to pay 2-10 percent of the contract into a margin account. If the value of the underlying asset rises, he just waits until the contract expires. He buys the stock at the low price, immediately sells it for the higher price, and pockets the rest. Leverage works the other way, too. If the asset price drops, he must add funds to keep his option open. If the price doesn't rise by the time the contract expires, he's lost the entire fee. Do hedge funds outperform the market? Some do, but most don't. Between 2003 and 2013, hedge funds returned 17 percent (after fees) while a stock-equity index fund returned more than 90 percent. 4. Day traders also hope to outperform the market using their own money. They use a formula to buy and sell a stock, an index, or a derivative during the day. They study news events and price trends to help them buy low and sell high before nightfall. But studies show most day traders don't do well. Four our of five day traders lose money. Only one in 100 profit on a regular basis. 5. The best way for an individual investor to outperform the market over time is with a diversified portfolio. Buy eight different assets that react differently to the phases of the business cycle. For example, when the economy heads into recession, some of your holdings will rise in value (bonds, gold). They will offset those that drop, like stocks and oil. 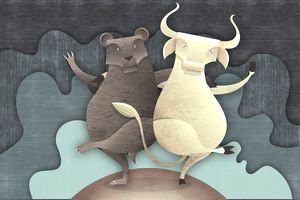 Wouldn't it be better to put all your money in bonds and gold in a bear market, and switch to stocks and oil when a bull market begins? Yes, if you knew for sure that was happening. That's called timing the market. It's virtually impossible for even professional traders to do. How do you know when a bear market has begun? It starts with a market correction of a 10 percent decline. In a market crash, this can happen in a day. If you happen to miss it, then what do you do? Sell all your stocks, in the fear the correction turns into a bear market? Then you can be sure the market will go even higher the next day, and you've missed all your gains for the year. Although all bear markets start with a correction, not all corrections turn into bear markets. You can see this for yourself by reviewing the 10 booms and busts since 1980. With diversification, you can gradually shift asset classes over time. You don't have as much at risk if you are wrong. That's the best way to outperform the market.